I spent last week in Austin at the behest of the National Security Technology Accelerator and TheIncLab. NSTXL is a non-profit that works across the Department of Defense helping to manage contracts and vendors. Last week they organized a pioneering multi-day event to bring leaders from virtual and augmented reality companies as well as government contractors, and various other technology companies together to consult with the US Army on their massive Synthetic Training Environment. It was a fascinating event, and showed an impressive willingness on the part of the Army to bring in private industry to help shape the contours of this impressive global initiative. 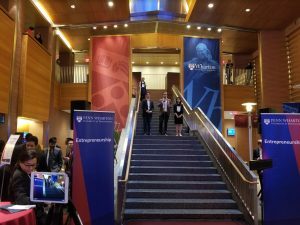 I just came back from being a judge in the Penn Wharton Startup Challenge on campus in Philadelphia. This was without question the highest level startup contest I’ve been a part of. There were over 200 judges. The contest had the startups submit decks, with or without financials, an application, and videos of personal statements and literal elevator pitches that were recorded in an elevator. The eight finalists, repeated their five minute pitches from the semifinals in the morning, then gave another two minute pitch on the staircase in Huntsman Hall. I got to know two teams quite well – Dexio: Blockchain for diamonds, and InstaHub: Snap-on occupancy sensors for light switches. I predict bright futures for both of them. Here’s a photo I took of Michal Benedykcinski, Timothy Clancy, and HQ Han from Dexio doing their final staircase pitch. © 2019 EZ Numbers. All rights reserved.